Email Us or message us on Facebook. The next Open Meeting is on March 5, 2019, at 7 pm at the Milford Senior Center. 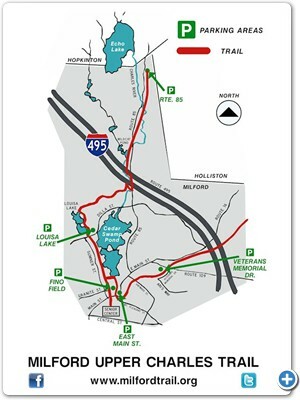 The Upper Charles Trail is a proposed 25-mile trail that will incorporate the communities of Milford, Ashland, Sherborn, Holliston, and Hopkinton, linking the towns via an abandoned CSX rail bed. Milford was the first town to open a complete 6.58 mile section and it extends from the town center north to the Hopkinton town line, east to the town of Holliston, and south to the Milford Senior Center. The Friends promote the use of the Trail year-round through social media, TV, the Web, and print. We also coordinate with several Town of Milford boards on maintenance issues and enhancements to the trail. If you like the trail, then please consider becoming a member. Membership starts at just $10 annually. Donations can be made through PayPal or by mailing a check to the Milford Town Hall. Please say hello and thank you our newest adopter, Boy Scouts Troop 2 of Milford! They will co-adopt section 5 of the trail along with the Cub Scouts Pack 67. There have been reports of traffic lights malfunctioning along the trail crossings by some trail users. If you experience this or any other problems crossing the street, please notify the Milford Police Department on their business non-emergency line at 508-473-1113. The Milford Trail Committee is working with the town of Milford on plans to improve the crossing signals at Dilla St. and Cedar St. (Rt. 85). These two crossing signals have had more issues than all of the other trail crossing signals in the town. Plans are in the works to improve these signals by removing vegetation overgrowth and by installing larger solar panels. Remember, always use caution & stop before proceeding to cross the roadways! •View Trail videos on YouTube. Click here for links. •Visit our newly updated Sponsors Page. They Help Us Maintain Your Trail. The Town of Milford, Parks Department is removing overgrown vegetation along the trail on an ongoing basis. This work is necessary to ensure that vegetation does not encroach upon the trail and to make the trail safe for all users. This may include the removal of nearby trees if they may be a hazard to trail users following inclement weather. Please use caution and proceed slowly when passing work zones. Cycling: using a "fatbike" with tires 3-inches wide or wider can provide some flotation over snow. Fitting winter tires, with studs, to your regular bike can provide grip on ice and in snow. Bring bright lights (and spares, if battery powered) due to the reduced daylight hours in winter. Hiking / walking: wear sturdy, lugged, and warm boots in addition to your normal winter wear if heading out on the trail. Bring one flashlight per person, even if heading out in daytime, due to reduced daylight hours. Add metal cleats to your boots for grip on ice. If the trail is covered in deep snow, then grab some snowshoes or cross-country skis. Use caution (remove skis) when crossing roadways. Construction of the Restaurant Depot commercial building on Cedar St. in Milford has commenced. This building is adjacent to the trail and the construction will involve the use of heavy machinery and work crews in the area. Please use caution when on the trail near the construction zone.